About Windows Me CD's differences (Windows Millenium Edition) - TACKtech Corp. So, you have seen Microsoft Windows Me on your friend new computer and now you want a copy. Well before you cruise to your local retail store or your favorite online vendor, there is some information you should know. One, there are several versions of the Windows Me package. And two, not all Windows Millennium CD's are created equal. 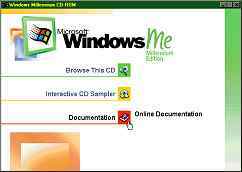 Let's have a look at Microsoft Windows Me OEM Disc and what it has to offer. The OEM (Original Equipment Manufacturer) Disc, when auto played, will launch the screen shown to the right. The third option is the one deserving the most recognition. Programs > Accessories > Interactive Training > Interactive Training. Another thing which separates the OEM Disc from the remaining CD's is that fact that it can be booted from for installation This helps to simplify the setup process. The only catch is your system BIOS requires the option to boot off CD-ROM. Note: OEM's are required to use the Microsoft Windows Millennium System Builder Preinstallation Kit (SBK) when shipping PC's preloaded with this operating systems. After installation, all of these version appear to be the same. I am however curious about what Microsoft means by "Promotional Encryption Coded Software", listed on the Promotional Step-Up version. The other two packages list "Encryption Coded Software." Now, if you'll notice in the second picture "Documentation" has replaced "Step By Step Interactive Training." This is a major bummer, especially to anyone who shelled out the whopping $209 for the full retail version. None the retail CD's that I have encountered are bootable like their OEM counterparts. However, the full version package contains a 3.5" floppy diskette for booting. The retail line has been graced with the same user manual. For the record, the version of Microsoft Windows Me that shipped with MSDN August 2000 is very similar to the retail full version a side from the hard coded product key. Please pay attention to the minimum hardware requirements specified, when considering the purchase of Windows Me. The list requirements are a Pentium or equivalent, 150 MHz or higher processor, 32 MB of RAM; and between 200 MB and 550 MB of hard disk space, a VGA or higher resolution monitor, CD-ROM or DVD-ROM drive, ACPI compatible for power management features (may require a BIOS upgrade). I recommend a minimum of an Intel Celeron 233MHz with 64 MB of RAM and a 1 GB hard disk.